Because we live in a post-Marvel universe where blockbusters are required to tease their sequels before the superpowered paint has even finished drying on the current one, more and more films are getting into the post-credits stinger game. (It was a particularly thrilling moment for audiences when the ending of Philomena showed her fighting Godzilla and Mothra in the eventual sequel Philomena: All Monsters Brawl.) Ghostbusters is no different, rewarding everyone who stuck around to find out who the second unit key grip was for the film. 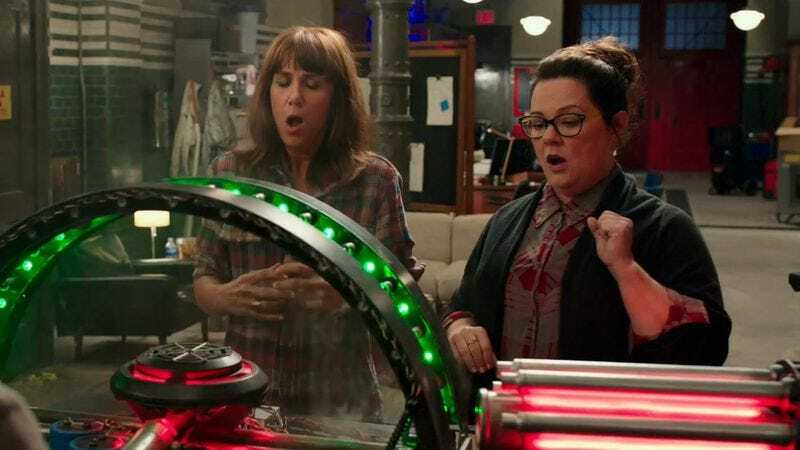 After the Chris Hemsworth-led dance party that takes up the majority of the credits winds down, and the “All characters are fictional but yes this is still a remake, we’re Hollywood, people” disclaimer fades from view, there’s an additional scene in which the four ghostbusters are sitting in their lab. Patty tells the others she’s picking up a weird sound, and then, after a pause just long enough to make you wonder if they’re seriously going to end with another fart joke, she takes off her headphones and asks, “What’s Zuul?” The implication is clear: The sequel will feature the villain from the original film—assuming it makes enough money to greenlight one. Given the movie was overall an entertaining and charming experience, hopefully any potential sequel will improve on the first installment. The obverse possibility, of course, is that it will be kind of lame—a worrying yardstick by which the reuse of all previous villains in new iterations of a franchise are judged, known as the Into Darkness Hamstring Effect.